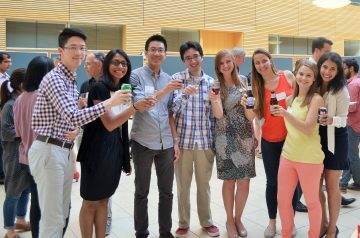 The Graduate Award Program (GAP) students from the Centre for Blood Research were tasked with organizing an event, as part of their program requirements. After long deliberations they have settled on a topic that is close to everyone’s academic heart. Seeking jobs after graduating in life sciences can seem like a daunting task, and therefore knowing the different options available can help enormously in choosing the right path. With the “Critical Skills for Success Conference” held on July 22, 2016, they aimed to expand their own and their peers’ horizons both in academic and non-academic directions. They invited 6 excellent speakers with diverse viewpoints to share their passions and advice in the workshops and a panel sessions. The career paths represented were academia, clinical research, industry, science communication, business consulting and science policy. Two sessions of three parallel talks highlighted the diversity of professions that people with a PhD in science can pursue, whether they have an academic appointment or not. Three of the speakers who had an academic appointment, talked about the variety of directions one can pursue independently or in parallel to a research career. Dr. Mark Winston, a Professor in SFU Biological Sciences, is also the Founding Director of SFU Centre for Dialogue and the 2015 Governor-General’s Award-winner for his bestselling book “Bee Time: Lessons from the Hive”. In his workshop, he took the approach of a dialogue with the participants, making a refreshing shift from the PowerPoint presentations. Dr. Winston highlighted the need to practice distilling one’s research in an approachable manner, so that it can be understood by a non-specialized audience. Parallel to his work in academia, he creates spaces for dialogue on complicated issues, leading engaged discussions on a wide variety of policy issues, from city planning to LGBT rights, all around Vancouver. Dr. Mark MacLachlan, a Tier 1 Canada research chair in supramolecular materials at UBC, also loves teaching. He is a recipient of the Killam Prize for Excellence in Teaching and bears a distinct resemblance to Leonard Hofstadter of the Big Bang Theory. An experienced and energetic lecturer, he emphasized the importance of catering to one’s audience and highlighted some tips and tricks of audience engagement when teaching. A prime example of this lesson is seen in his interview with the Vancouver Sun, where he shares his passion for inventing new materials and simultaneously gets the readers excited about Chiral Nematic Mesoporous Silica. Similarly, Dr. James P. McCormack, professor at the Faculty of Pharmaceutical Sciences at UBC, has found his passion in teaching through podcasts –he is a co-host of the award-winning Best Science (BS) Medicine Podcast. In his Science Communication workshop, he highlighted the importance of remaining vigilant about medical stories. In an interactive session, the audience was asked to evaluate an online CNN medical article, learning to keep a critical outlook on science in the media. The workshop emphasized that data are relative to the context of current medical knowledge and that even negative results are important: “it’s also important to show that something doesn’t work”. Useful tools and tips can be found at www.healthnewsreview.org. Three other speakers discussed their non-academic professions and shared their insights into pursuing unique careers post-PhD. A workshop on resume writing and interview skills presented by Dr. Jennifer Moody, a VP for Commercialization at the Centre for Commercialization of Regenerative Medicine in Toronto, started off with insightful coverage on proper resume writing for an industrial position. She taught how to “communicate your Value proposition”, meaning to demonstrate one’s added value through a resume and interview. It involves highlighting one’s key accomplishments and addressing specific skills that make one suitable for the desired position. Dr. Moody was very honest in what interviewers may look for in the industry from recent graduates, such as personality fit, leadership and initiative taking. Her career path took her from her postdoctoral studies in Sweden to the R&D in industry in Vancouver. You can read more about her career path in her interview with the International Society for Stem Cell Research. Dr. Agatha Jassem, a Clinical Microbiology Fellow at National Institute of Health, discussed her unusual career edging between a scientist and a physician. In this session, she talked about her job as a clinical researcher. In this profession, she oversees a diagnostic lab and works side by side with physicians and patients. The goal is to provide prompt, accurate diagnoses of infectious diseases which involves significant lab responsibilities. Her lab work is used for patient-specific “detective” work, as compared to research, where experiments are meant to lead to new discoveries impacting patients in the future. To become an accredited clinical researcher, she is currently completing a 2-3 year fellowship program, which closely resembles medical residency. Dr. Cara Ferreira is the Engagement Manager at McKinsey Global Management Consulting. McKinsey Consulting is a global giant, using teams of PhDs to consult on management decisions across the public and private sectors. In her business consulting workshop, Dr. Ferreira pointed out that the specific area of one’s PhD is not important, as McKinsey Consulting hires all different backgrounds. The important qualities that they look for when hiring new graduates are the ability to think critically, have a problem solving mindset and demonstrate intellectual curiosity. The workshops were followed by a panel discussion where participants could ask questions from any of the speakers. Having a panel of professionals from such diverse career paths was very inspirational and provided great advice for all attendees. The conversations then continued over wine and cheese for several hours facilitating new relationships. 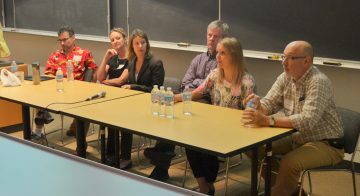 A deeper look into the work-life balance of these successful individuals along with their unwavering sense of humour brought hope to current graduate students and postdoctoral fellows in the audience. All in all, another perfect day for learning at the CBR!